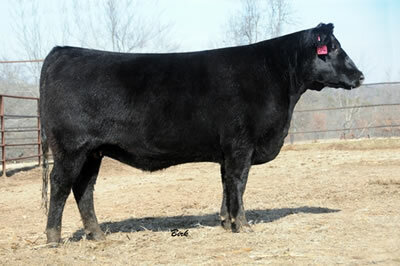 Stems back to the featured SAV Bismarck 5682 bull and DHT SS Obj ND 878 494, who stems back to the legendary Pathfinder sire, SS Objective T510 0T26 thru her dam DHT SS Obj ND 878 494 who ranks in the top 2% of current dams for CED, $W , $G, $B and top 3% or higher for Milk, Marb, RE and $QG. This dam records IMF of 137 and RE of 117. This dam has full sibling DHT 494 Bismarck 5422 who has balanced trait EPD strength, and no peers. 5422 offers Top 1% $Weaned and Calving Ease with an easy fleshing top 10% $Beef EPD with large Scrotal Circumference. This bull eliminates his competition with CED, WW, YW, SC, $W, $EN, Marb, RE, and Fat for a balance of EPDs that beat all other bulls. DHT 494 Bismarck 556 ranks at top of breed for $W and top 2% for CED, CEM and RE and has impressive phenotype!